You will be lost for words, as soon as you set your foot on the overwhelming island of Samothraki! This is going to be quite an adventure for you to explore the mainland and dive in the crystal clear waters of the Aegean Sea. In order for you to know the spectacular uniqueness of Samothraki, you had better visit the villages that stretch throughout the inland. In this way, you will have the chance to fully comprehend why all these people overwhelm the island every year and why there are so many different things for everyone to engage in, while being on vacations. There are twelve villages all over the island of Samothraki, with the capital being Chora and attracting tourists from afar. Chora is situated right next to the village of Kamariotissa. This is the central port of the island and it offers travellers the opportunity to go on daily cruises and enjoy their swimming and diving experiences, go snorkelling and scuba diving. Profitis Ilias is another magnificent village, which is located up in the hill bearing the same name. You will have the privilege to overlook the Aegean and even glimpse at the Aghion Oros (Holy Mountain) from the high altitude of this village. Besides the spectacular views, you can taste the local specialties at one of the taverns stretched throughout the village. Next to Kamariotissa village, there is Therma. Perennial plane trees and rare examples of wildlife complete the scenery and motivate you towards taking on hiking excursions and explorations of the flora and fauna of the island. Moving forward with the villages of Samothraki, you can visit Lakoma and get carried away by the friendliness and hospitality of the locals, as much as the fabulous scenery all around. Alonia and Ksiropotamos are two other villages of exceptional beauty and remarkable diversity. Surrender to the imposing architecture and the marvellous natural landscapes, so as to grasp on what Samothraki is all about. 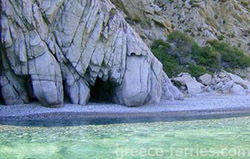 After having explored the mainland and after having visited at least some of these villages of supreme beauty and elegance, you will get to enjoy the quintessence of Samothraki. Do not hold back on the experiences that you can gain!